HomeExperience LevelAllAre All Those Reps Really Making You Better? We’ve all been raised with the concept of muscle memory. Repeating things over and over in order to get good at anything. The more reps, the better. Turns out that isn’t exactly the case, so learn what really does make you better. It’s what we’ve been told our whole lives – if you want to become good at something you’ve got to repeat it over and over again, in fact, up to 10,000 hours’ worth in order to build outstanding muscle memory. 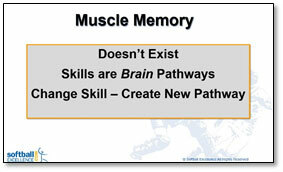 But it turns out that muscles don’t actually have any memory. Memory is something that lives in the brain. The brain is where all skills start. Sure, skills end up in the hands pitching a ball, or the feet sprinting to first, or the body swinging a bat – but all those movements are simply commands being sent from the command center – the brain – out to the various body parts that make it actually happen. Repetition – doing something over and over again – is important, but not in the way we were led to believe. All skills are first located inside your brain, in order to do a skill, even in a beginners-horrible-like fashion, the brain has to issue a command to the various body parts involved with that skill. So let’s take pitching. For a player to actually pitch a ball, the brain has to issue a ton of different commands at different times involving different speeds to different body parts. The fingers have to grip the ball with just enough pressure and the arm has to move at a certain speed at a certain time and then the hand has to release the ball in a certain way. And don’t forget that in the middle of all this the feet have to do different things at different speeds and at different times. Oh yea, and all this has to come together (something we call “timing”) or the whole motion is a mess. Pretty complicated, right?! You bet it is, and yet that’s what our brain is built to do – issue complex commands to our body parts to handle all of life’s tasks from walking to sitting down to driving our car to texting to recalling our sales figures to cooking dinner to running our practices. Everything we do all day and night starts in our brains. In fact, our brains are constantly calculating and re-calculating in order to keep us operating in the way we need to for whatever thing we’re doing at the specific time we’re doing it. And there’s the secret to learning, or mastering any movement – it’s the calculating and recalculating by our brains that allow our first dangerously failed attempts at something like simply standing up, to eventually get us not only to being able to stand up, but to walk and eventually to run. Yes, it takes try after try after try. No doubt about it. But every new try has some new information the brain has gathered from the previously failed try that allows the brain to form a new road inside our brain, or neural pathway, and to basically, reprogram the try. 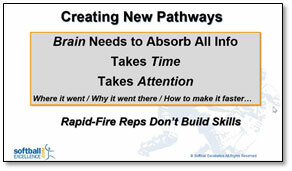 Take enough time in-between reps to allow our brain time to recalibrate our next try. Mentally connect to our effort to allow this mental recalibration to happen. Yes, repetition does make us better but not the rapid-fire kind that we commonly see at softball practice. It’s not the muscles that are trying to remember, it’s the brain. Our brain needs time to think through the last effort and figure out what needs to change with our next effort to keep us moving upward in an ever-improving direction. Those rapid-fire reps we’re so used to in practice not only prevent our brain from recalibrating our tries, but they also get our brains to check-out which means our players are actually paying less attention…which is never a good thing! S-l-o-w down. More isn’t better unless it’s more done better. I have been using the philosophy of ” slowing it down to speed it up ” for years. If you want more info on the subject, there are two books around this topic, the 1st is “The Talent Code” and the 2nd is “The Little Book of Talent”. Reps are important but its quality over quantity. thanks Toby – Daniel Coyle, who wrote both books you mention details tremendous information on this topic!! Great books for anyone who has not read them!! I am in the process of reading “The Talent Code”. My eyes have been opened. This information is incredible and should be in the hands of every teacher, coach, instructor and of course parent. I was so wrong for so long in my thinking about talent. I had always believed that some kids are just born with certain “God Given” talents. I further believed that the complex skills required to hit a pitched ball, the greatest challenge in all sport in my opinion, could only be “mastered” by those with those “God Given” talents. Your article and the book “the Talent Code” are convincing me that with enough dedication and “deep” practice nearly any kids can at least become proficient and productive hitters, pitchers, players. there will always be those phenoms, and prodigies that come along ever so often but there is really no excuse for any kid to be told they don’t have enough talent to play. Thanks again for the article. At the risk of sounding dramtic I am going to say that this could change peoples lives for the better. Great comments Benji – and i couldn’t agree more!! This entire topic of how we learn best and the idea that talent can be learned vs you’re just born with it is not only fascinating, but super important as coaches. Carol Dweck has coined the phrase “Growth Mindset” from her studies with kids on this exact topic. And also check out Blocked vs Random practice methods…we’d all change our practices immediately if more of us read stuff like this!! Daniel Coyle is finishing a new book that should be out soon…it will be another great one!